It's been quite a week since the last time we talked. Remember how I mentioned the stressful car repair situation? Well, that took a somewhat surprising turn. The past 6 days or so have been a blur of emotions and prayer, let me tell you. You got time to chat? I need it. Let's get our beverages! "Oh yes. Well. This isn't going to be cheap." This from the man whom I regularly pay $600 at a time for various and sundry car-related reasons. I braced myself for the total, now that he had the part actually lined up: $1700. My car is nearly 18 years old. Now that the number was concrete, Mike and I agreed that it just wasn't worth it to get it fixed. We fretted about coming up with the money for the down payment, but we have savings for this very reason. We'd look for a lease we could afford and hope for the best. 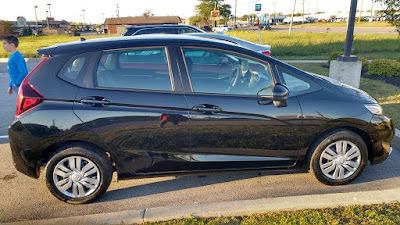 I had my heart set on a Honda Fit. When I bought my Civic back in 2000, they didn't yet have the Fit in their fleet. 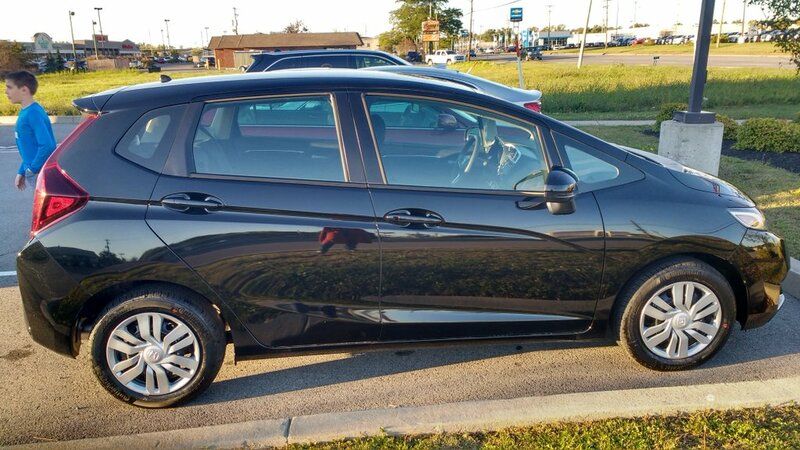 The Fit is the perfect size for me, and I ADORE hatchbacks. I had one in my very first car, a Nissan Sentra from the 80's, and the thought of having one again really appealed to me. I can put the seats down, get my dance paraphernalia in there, giant Scentsy boxes, the Christmas tree... ;-) They also get great fuel mileage, and are incredibly adorable. Plus, they're less expensive than Civic. Win/win, right? Well. It's the end of the model year. The great leasing deals are on the 2017 vehicles, not the new 2018 ones. There aren't many 2017 Fits left to be had anywhere, and throughout Central and Western New York, all the way down to Erie, the only vehicles remaining all had manual transmissions. "Do you know how to drive a manual, Tiffany?" you reasonably ask. Not exactly. But yet, what is sitting in my driveway at home right now? YEAH. What can I say? I had a bold moment. I suppose some people would just say that I've lost my mind. In fact, at this moment, *I* think that I have lost my mind. But Mike drives a manual and loves it, and is SO EXCITED to teach me. I suppose true love made me do it? "Hon. This bold side of you is really...NICE." Pretty sure it is, but right now, I have LOTS of other things occupying my little brain. "OK, what the *%;#! with this clutch/acceleration thing to get started?! How did cars even evolve like this? WHO ever thought this was a feasible long term model?!" "All right. I got it that time. I'm doing better, right? Now...Wait, what just happened? CRAP!!" "I'm not going to stall this time. I'm determined not to. We'll just give it a little more gas..."
"Look! It's moving! Oh God. There's another car! I don't want him to come near me!!" "...already 80% of the way there since you already know how to drive!" Um, NO. I don't feel like I'm 80% of the way there. In fact, I feel like I'm 16 years old and that I'm learning how to drive all over again. I am here to tell you, good and gentle readers, that this is NOT a very pleasant feeling. Sunday night, after an outing with more stalls and jerks back to a start than I could possibly count, I was in tears. Mike keept reassuring me that I'm coming along fine, that it takes WEEKS to get comfortable with a stick shift, and that this is all a very normal part of the learning process. But I tell you, dear readers...this is HARD. I mean, I'm certain not everyone finds it all that difficult to learn how to drive a stick shift, but this is hard *emotionally*. It is a humbling, humbling experience to take something for granted, something that you've been able to do for decades, and suddenly be thrust back into Beginner Land, complete with honking horns, angry faces, and overall truculent nostril flares by others who do not realize what you are going through. I haven't been able to sleep, and in the evenings, I cannot knit or otherwise relax the way that I used to. My mind is constantly racing with my fears that I will never master this skill, that I will continue to embarrass myself in public, that I made a huge mistake which I will regret every single day for the next 3 years, and that I'll never regain the independence I once enjoyed when I felt comfortable driving. Monday morning I woke up emotionally fragile. I felt like a loser, a Manual Transmission School Drop Out. I drove my in-laws' automatic to work, fearful that I wasn't ready yet for longer journeys. I felt shaky and apprehensive about everything I was going to face that day. I had moved office spaces on Friday, and so Monday morning before my 9 am class I opened the door to my new office for the very first time, feeling a surge of hope that the clean, refreshed space would lift my spirits. There was a man standing in my window. While I watched incredulously, he schlacked some goo from the metal tool he was holding onto the bricks on the outside of the library. This was actually happening. I had a brick mason over my shoulder, in my window, for the entire day. While I lesson planned. Ate lunch. Graded student work. My buddy was there. A guardian angel of sorts? Likely not, the entire thing felt incredibly awkward. An omen of things to come? Even worse, I knew that I had to get back on the horse. The paperwork is signed, the deal is done. I'm stuck with the car. I love her, she's adorable and precious, she just scares the s*%! out of me right now. I left for the day braced for my evening practice session. I did not want to get back in that car. But I knew that I had to. The fear was only going to fester the longer I let it go. After dinner, Mike and I headed out. I was still stalling the car, but somewhat less often. Unfortunately, this meant that I was overcompensating on the gas pedal and jerking the car forward with a squeal quite a bit. But not stalling boosted my confidence, and I needed that VERY badly. We made it out onto slightly busier roads than the side streets we had stuck to before, and I managed all right. I kept it together and didn't stall. Mike said that I was ready to drive myself to my fitness class later that evening. I didn't want to, but I knew that I had to. Fit and I headed out to the dance studio. I stalled backing out onto the street. But I got her restarted like a champ, and bumped my way along. The rest of the way there, I did some jerking and squealing, but I did not stall. I made it to the studio alive, and I call that a huge win given the circumstances. The way home was even better. I was freaking out because the house I parked in front of had people outside, and I knew that if I stalled or squealed my tires they would see me. But I didn't. I got it going well and even eased into a left turn in 2nd gear with no problems. No stalls at all on that trip. Things were still fragile, but they were improving. Yesterday, I had my best trip yet (relatively speaking :0). We went out on busier roads, and I didn't stall AT ALL. Well, unless you count that crazy situation with the Bobcat digger thing pulling unexpectedly out into traffic, which I do NOT. 😎And my jerking starts are getting decidedly less bad. Suddenly, I can feel a difference on the pedals. I've realized a few things about how to let up on the clutch and depress the gas pedal, and it's showing. It's still not anywhere near 100% smooth starts, but I've clearly improved. For the first time, I feel hope that I actually will learn how to drive this car. I'm still not driving it to work yet. Yes, I know that I need to just do this and that's how my learning process will reach it's zenith, but I'm being kind to myself. I'm getting there, I really am. I want to nurture my confidence for a few more days. We're going to do a practice run tonight. I know that I may experience a setback at some point. After steadily improving, you may stall again at a very inopportune time. It happens. But my motivation and determination are high. I want to learn this. I can do this. "Always bear in mind that not all answers can be found THE EASY WAY." Sometimes, challenges are good for us. Granted, learning to drive a stick shift is hardly some important act of public service, or a larger spiritual goal. But allowing ourselves to be lifelong learners, and not always making the comfortable choice, makes us better people beneath the surface. This can then lead us to step forward in situations that DO have a larger spiritual or charitable component. "Fear stifles exploration. And exploration is a GOOD." It is, it really is! I certainly have moments when I wish I had just gotten a different car, so that I could have just gotten an automatic transmission, and I wouldn't be going through this stress right now. But this has been good for me. It has made me realize that I'm not too old to try new things, to have confidence that I can master an unfamiliar skill. I still have a long way to go, but I have faith that it's going to work out just fine. All right. Let me hear from you. Who thinks I have lost my mind?! :0 More importantly, who here drives a stick shift?! I need some words of commiseration! I think some cars are easier to learn manual on than others. When my father attempted to teach me, it was on a truck. And I am short. I basically was having to stand on the clutch which made it basically impossible to get the car moving. So I basically told him under no circumstances would I attempt that again. My husband drove a really beat up old car. So when he had me go around the neighborhood his clutch was easier to handle. I guess this is my long winded way of maybe you should see if it's easier for you to drive your husband's car since you said it was a manual. The newer car may have a stiffer clutch causing you to stall more because it sounds to me like you have the same problem that I have which is smoother movements ie letting out the clutch and easing on the gas. Currently I technically drive my husband's vehicle and he drives mine (although paper work wise we both own the vehicles). My car gets better gas mileage and he commutes more. His SUV, which he inherited, is bigger and I can transport the kids and all their stuff around easier. Not sure if your husband would like the arrangement but if you find his vehicle easier, it could be a suitable temporary alternative until you get the feel of things. That's not a bad idea! I haven't tried his since Saturday, before we brought my car home. An interesting possibility, for sure! Oh wow, you are braver than I. Never drove shift, never aspire to! But if it's any consolation, my 82 year old mom used to and if put to the test she still could. She said it's like riding a bike, once you learn it will be good. Guess my question would be, is it worthwhile to you to work through until it's second nature? Honestly...right now, I feel like it isn't. But I had a rough go of things last night, so that's likely why. It hasn't even been a week yet, I know that I need to give it more time. We'll get there. Aw, what a week you've had! I've noticed that many people - including myself - come to really love driving stick shift and miss it when one gets an automatic transmission. There's something very satisfying about performing a small technical task proficiently in today's world of so much automation. I think our cars will last at least another 20 years - we hardly drive - but when it's time to buy a new car it's going to be a stick shift. Think of it this way - learning new tasks is forming new neural pathways and protecting you from dementia! This makes me feel better, thanks Amy! dancer, I know you know about timing! 😀 Keep practicing and it will become second nature. Promise!!! BTW, she’s beautiful! Thank you Beth! The gear shifting is going pretty decent (I only make an occasional mistake accidentally shifting into say 3rd gear when I intend to go to 2nd, and the engine revs funny), but it's the starting from a dead stop. :-\ I thought I had it, then it was like a switch was flipped, and it's sucking all over again. :0 I need to keep my spirits up! You've got a cute car and hatchbacks make it easy to put stuff in the car. Most of my family borrows my car (a hatchback) when they have stuff to move. I'd never driven a car with a stick shift. At one point I kind of wanted my Dad to teach me how just because I thought it would be a good skill to have but it never happened and now he has an automatic. Good luck with the learning process. I'm sure you'll get the hang of it. I hope so. :0 I love the car on the outside, but sitting on the inside turns my insides into a giant pretzel. Really hoping that this passes soon. It doesn't, but the 2017s are out of stock in automatic. I would have to get a Civic instead. Believe me, I have thought about it, lol! But I'm making progress, and that progress is satisfying. I think I'm going to keep at it!